Gadget: Worshiping a soda jingle and led by a fruitcake and a guy wearing a diaper--now that I think about it, it does seem kind of logical. Gadget: I'm here to show you that when They said All Rights Reserved they ment it! Gadget:You guys are so going to regret ruining my jumpsuit! Wait'll you get my drycleaning bill! 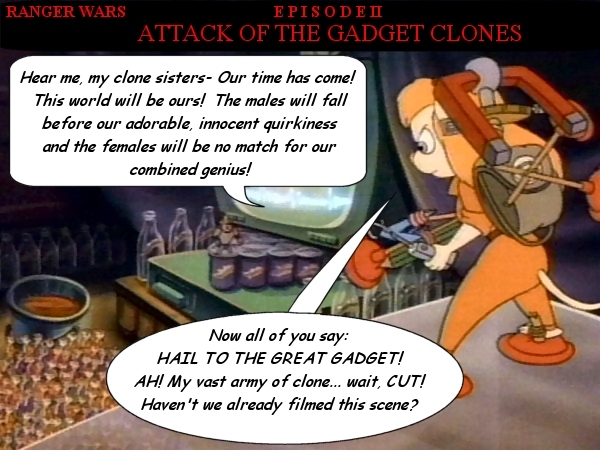 Gadget: At last I have found the salesman convention, revenge shall be mine! GADGET: OK, let's see... cheering crowd of adoring fans: always... high vantage point: check... cool jumpsuit: check... high-powered proton accellerator plunger: check. Ok, where's that Stay-Puft Marshmallow Dale? GADGET: Batman, eat your heart out. Monty: Gadget, my girl, have you ever flown a gunship before? Gadget: I think so, Monty. The PAH-2 Tiger was an odd-looking gunship than my AH-64D Longbow Apache. Painless Doc Johnson - Ah, Lahwhinie steps in. Should we be concerned about this? Gadget: The Forces of Isengual and Mordor march upon the Rangers. Gadget: Mission accomplished: One "House of Mouse" videotape magnetically erased! My work here is done! Gadget: Muridæ of the world, unite!!! Gadget: I'm the real Gadget yes I'm the real Gadget, all you other Gadgets are just imitating! So will the real Gadget please stand up? Please stand up? GADGET: Ancient bottles and made-up religions are no match for a good plunger at your side!